But over the last few decades, the warming climate has brought more rain and less snow in some winters. These rain-on-snow (ROS) events can cause ice to form on the ground. The ice coats the reindeer’s preferred food and causes them to starve– a potential catastrophe. 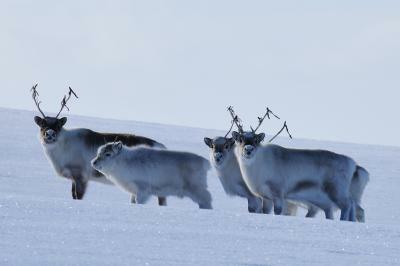 In a study just published in Nature Communications, researcher Brage Bremset Hansen, from the Norwegian University of Science and Technology’s Centre for Biodiversity Dynamics (CBD) and colleagues describe how they modeled the effects on reindeer population dynamics if icing becomes the norm, rather than an extreme event. Using this information and a biological model called an Integrated Population Model, or IPM, the researchers created what amounts to a detailed picture of the Svalbard reindeer population –with annual population sizes, survival and reproduction rates for six female age classes. Reference: More frequent extreme climate events stabilize reindeer population dynamics. Brage B. Hansen et al. Nature Communications 2019. DOI: 10.1038/s41467-019-09332-5.